Aggregate campaign performance over time by list. Use the dropdown menus to filter by Date Range, List Selection (Primary/Secondary), Show data as a percent or total number, and by bar or column Chart. Click the Download CSV button to download the report. Use the Toggle Columns button to choose column headers for the report. Choose the list type, either Primary or Secondary. Number of users to who the list was sent. 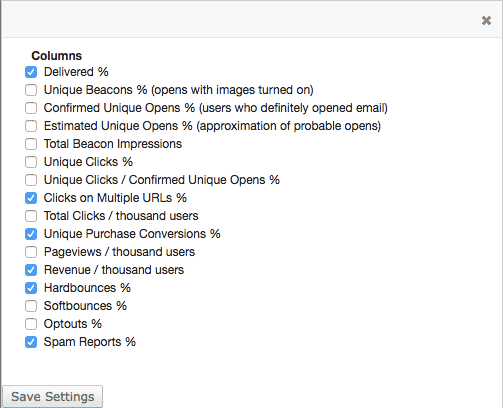 For users on the list, the percentage of campaign sends that result in at least one email click. Note that mass mailings typically have some number of undeliverable messages (bounces), so the percentage is typically higher when you compare clicks to your delivery rates, instead. Clicked Multiple URLs. For users on the list, the percentage of campaign messages sent in which a user clicks multiple links in the message. Note that mass mailings typically have some number of undeliverable messages (bounces), so the percentage is typically higher when you compare clicks to your delivery rates, instead. The number of users who went on to purchase. You must implement Purchase API call for this data to appear. The amount of revenue generated by purchases from this campaign, per thousand users messaged. You must implement Purchase API for this data to appear. Users who have chosen to globally unsubscribe from your email. Opted out users will automatically be suppressed — not sent to — even if they are still on the list that you are mailing to.